Each year, thousands of people are involved in motorcycle accidents, and sadly, many of these people are seriously injured or killed. In fact, according to the National Highway Traffic Safety Administration, 5,286 motorcyclists died as a result of an accident in the U.S. in 2016. Add this to the 88,000 motorcyclists who were injured in 2015 (The latest year for which there are statistics.) and that makes motorcycles much riskier than cars. Moreover, motorcyclists are 28 times more likely to be killed in a crash than drivers and passengers in cars. Many of these injuries and deaths are caused by the negligence of other drivers. Distracted drivers, drunk drivers, tired or inattentive drivers hurt and kill motorcyclists. That is where we can help. At The Collins Law Firm, getting compensation for personal injury victims is what we do. Our motorcycle accident attorneys have spent decades aggressively protecting accident victims and their families, and we know what it takes to get you the full compensation you deserve. What Should You do if You Have Been in a Motorcycle Accident? How do Our Attorneys Fight on Behalf of Clients? What Kinds of Motorcycle Accident Cases do We Handle? What Types of Injured Motorcycle Accident Victims do We Represent? What are the Primary Causes of Motorcycle Accidents? What Risk Factors Make Riding a Motorcycle More Dangerous? What Steps Should You Take to Stay Safer on the Road? How do the Laws Regarding Motorcyclists Affect You? What Damages Can You Recover in a Motorcycle Accident Lawsuit? What Are the Motorcycle Crash Statistics in Illinois? What Should You do if You Have Been in a Motorcycle Accident?? The minutes right after an accident are extremely stressful, however, there are some steps you should take to protect yourself, if you are able. Make sure you are safe. Make sure to get out of the road and out of the path of other vehicles. Then call 911. Get medical help if you need it. 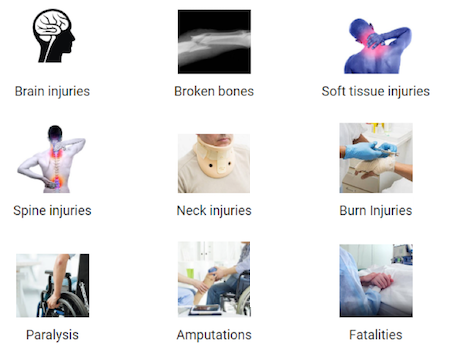 Check yourself for injuries even if you do not think you are severely injured. Adrenaline may be masking the pain and some injuries have a delayed reaction time. Call an ambulance and get to a hospital if you have any concern about whether you’ve been seriously injured. Exchange information with the other driver. This should include your name, contact number, driver’s license and insurance information. However, do not say anything else to the other driver. Report the accident to the police. This is especially true if the accident is serious. The police will respond to the scene; take notes on what happened; possibly issue a ticket; and make a police report. Make sure to tell your side of the story. The police report may have an assessment of fault, so you should order a copy of the report because it could be helpful in a personal injury case. Start collecting evidence. Take pictures of the other vehicle, your motorcycle and the scene. Talk to any witnesses and get their name and contact information. Take some notes about the accident while it is fresh in your mind. Keep any clothing or a helmet that has been damaged. See a doctor as soon as possible after the accident. Seeing a doctor is critical to determine if you are hurt and provides proof for your claim. Remember to use your insurance even if the other driver was at fault. And take photos of any injuries. Keep excellent records. Keep all medical bills, doctors’ reports and motorcycle repair bills. In addition, keep any documents relating to days off work and lost pay. Finally, keep a journal of the accident and all the ways that it has affected you physically and mentally, including ways it has interfered with your daily life. DO NOT talk to the other party’s insurance agents or lawyers. 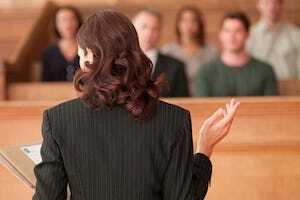 They are trained to get you to say something that will hurt your case. In fact, you may want to have a checklist of things to do after an accident in the glove compartment of your car. This can help if you are stressed and not thinking clearly. Motorcyclists face unique challenges when they are involved in a crash with an automobile. First of all, motorcyclists are more likely than the driver of the car to be seriously injured, and then they face anti- motorcycle bias when they try to pursue a claim in court. Many American automobile drivers resent motorcycles and blame them for accidents because they are harder to see. In addition, negative cultural stereotypes give jurors the impression that motorcyclist are reckless, rough and disreputable. This false assumption leads them to believe that the motorcyclist was more likely to have caused the accident. In reality, motorcyclists are a very diverse group of people and the driver of the car is more likely to be at fault when a motorcycle and an automobile collide. However, when motorcycle accident cases go to trial, injured motorcyclists typically receive smaller verdicts than automobile drivers with similar injuries. In addition, many insurance companies are more likely to 1) deny that the car was at fault and defend the automobile driver instead of settling with the injured motorcyclist, or 2) offer a smaller settlement amount. For these reasons, it is critical that a motorcyclist who is injured in a crash that was caused by an automobile driver retain a motorcycle accident lawyer. At The Collins Law Firm, our experienced, aggressive motorcycle accident lawyers fight for the maximum compensation that Illinois law allows for motorcycle injury and fatality cases. Thoroughly investigate your accident and determine how much your claim is worth. Collect critical documents such as: traffic light data, repair estimates, lost wage forms from employers and cell phone records. Photograph the vehicles and the scene of the crash. Talk to witnesses, police officers and the victims and get their statements. Gather all medical records, bills and reports from treating physicians. Find and review any videotape that may show the crash. 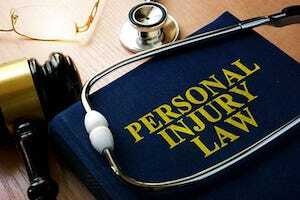 Give you the legal advice you need to strengthen your personal injury case. Retain the best experts to help prove your case, including recreating the crash with an accident reconstructionist, if necessary. Review any computer recordings or "black boxes". Keep you informed about the status of your case, so you can focus on getting better. Talk to and negotiate with the insurance company. Represent you aggressively in court if the insurance company refuses to settle. What Kinds of Motorcycle Accidents Cases do We Handle? The Firm represented a young woman who as a passenger on a motorcycle was thrown from the vehicle after a rear-end collision with an SUV. Our client sustained significant injuries including a herniated cervical disc that required surgery. The lawsuit was settled for the confidential policy limits. We are currently representing a motorcyclist hit by a teen driver in Kendall County. The teen driver made an improper left turn which caused the motorcycle to collide with the vehicle’s passenger side. The motorcyclist was knocked unconscious and suffered facial trauma and multiple head injuries. This case involves the teen driver’s insurance policy as well as the motorcyclist’s underinsured driver policy. Drivers who fail to yield. Drivers who fail to keep a lookout. Drivers who fail to follow stop signs or traffic lights. Drivers following too closely behind a motorcycle. Motorcycles are much more likely to overturn than automobiles. Bad road conditions affect motorcycles much more than cars. Weather can also be dangerous or deadly to motorcyclists. Motorcyclists have so much less protection in an accident. Gender: Men are more likely to be affected by motorcycle accidents than women. In fact 90% of fatalities involve men. 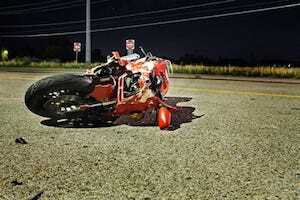 Age: Young men in their 20’s have a much greater risk of dying in a motorcycle accident. Helmet Use: Helmets reduce the risk of dying in a motorcycle accident by 37%, and the risk of brain injury by 69%. Alcohol Consumption: Over 25% of motorcyclists involved in fatal crashes in 2016 were alcohol impaired. Motorcycle Size: Smaller and sportier motorcycles have the most fatalities, although the number of large motorcycle crashes appears to be going up. Wear a helmet. This is the most important safety rule. If you follow none of the other rules, follow this one. Helmets save lives. Not all states require that you wear a helmet, but helmets prevent serious brain injury. Save your brain; wear a helmet. Obey the rules of the road. This one is easy. Signs, speed limits and lane markings are there to keep you safe. Do not ignore them. Do not speed, cut off other drivers or fail to yield to another vehicle who has the right of way. Following these rules will make for a more enjoyable-- not to mention safer-- ride. Steer clear of bad weather. Check upcoming weather before you head out on the road. Certain weather conditions like rain, wind and fog can make riding a motorcycle dangerous. Avoid riding in bad weather and have a plan for what to do if the weather changes when you are on the road. Try to stay as visible as possible. You cannot assume that drivers are looking out for you. In fact, many times they cannot even see you if your motorcycle slips into their blind spot. Keep your lights on when driving and wear bright, reflective clothing to increase your chance of being seen, especially at night. Ride defensively. It would be nice if drivers in cars drove carefully around motorcycles, but you cannot count on this. It is your responsibility to drive defensively: give yourself lots of room to make turns and change lanes, and give motorists lots of notice when you do. Refrain from speeding, sudden moves, and cutting in front of cars. Get familiar with your motorcycle. Inexperienced riders are the most likely to get hurt. If you cannot handle your motorcycle at all speeds and in every type of weather, practice in a safe place before you go out riding. Every motorcycle is different. Get familiar with how it handles, and where all the controls are so you won’t be surprised on the road. Check your bike before every ride. This is also an important step. Check your brakes, tires, and fluid levels and you will save yourself a lot of trouble. Do not drink and drive. Alcohol and motorcycles do not mix. Under no circumstances should you drink and drive. Motorcyclists must have a special driver’s license. You cannot drive a motorcycle with a regular driver’s license. The requirements vary from state to state, but usually, motorcyclists must take special training classes that teach them the basics of handling and riding a motorcycle and then pass a written and driving skills test. In Illinois, you must pass a written test and a rider skill test to get a motorcycle license. However, if you are 18 or older; have a valid driver’s license and have passed an IDOT approved motorcycle training course, you are exempt from this requirement. If you are in an accident and do not have a valid motorcyclist’s license, this will hurt your case. Some States Require a Helmet when riding on a motorcycle. Nineteen states across the country--but not Illinois--require that all riders wear a helmet. 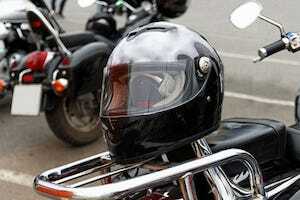 Some states require helmets for younger riders. Be aware of the requirements in your state, and check the laws when riding outside of your home state. Motorcyclists may be required to wear other protective gear. These laws also vary from state to state and may require riders to wear protective eye wear or padded clothing. In Illinois, eye protection is required for riders of all ages. This protection can consist of glasses, goggles, a wind screen or windshield. Check the requirements in your state. Motorcyclists may need special equipment on their bike. Some states require riders to equip their motorcycle with reflectors, turn signals or safety lamps. Motorcycles in Illinois must have a passenger seat and footrest for any passengers, a muffler and one side-view mirror. Helmet speakers are only allowed for communication, not entertainment. Motorcyclists are not allowed to lane-split. Lane-splitting is a term for riding between two lanes of traffic, and it is illegal in every state except California. Prohibitions in Illinois. State law prohibits handgrips above head height of the operator, riding no-handed, and riding on one-wheel—also called doing a wheelie. The other driver. There are various parties who may be liable in a motorcycle accident. First and foremost is the driver of the other vehicle. 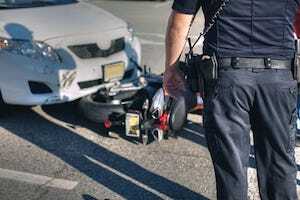 If that driver has caused harm to a motorcyclist, then the motorcyclist’s attorney will file a claim against the other driver’s insurance company. The agency constructing and maintaining the roads. 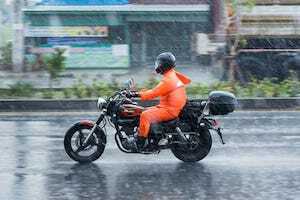 If the road conditions caused the accident, a motorcyclist may sue the agency responsible for building or maintaining the road. So, even if no other cars were involved, you still may have a case. Missing or faulty traffic signals, potholes, blind corners, and uneven surfaces: all of these can cause a motorcycle accident. However, if you are planning to sue a government agency, be aware that the statute of limitations may be very short, so do not wait. The motorcycle manufacturer or designer. If the crash was caused by some problem with the motorcycle itself, you may be able to sue the designer or manufacturer of the bike. These lawsuits are product liability lawsuits and work differently than typical motorcycle accident cases. They fall into two categories: 1) manufacturing defects and 2) design flaws. A good motorcycle accident attorney will know who to sue. There are four elements to a negligence lawsuit: duty, breach, harm and causation. All drivers have a duty to drive safely and follow the rules of the road. 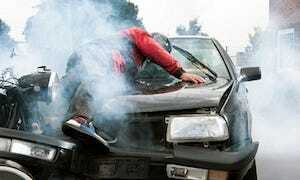 If a driver breaches this duty and causes an accident, he or she may be liable for damages. This can be easy to determine in simple cases where a driver broke a traffic law, such as ignoring a stop sign. At other times this can be more difficult to determine, for example, when you are trying to prove that the defendant did not act like a "reasonable person" and drive with care. Occasionally, the other driver’s behavior was so risky that they are charged with recklessness. An example of this would be an accident involving a drunk driver, and in such a situation you might be entitled to higher damages. Finally, the accident resulting from a breach must be determined to have caused harm to the plaintiff for a case to be filed. Shared fault: What if both the motorcyclist and the other party were at fault? Maybe there were several factors involved: perhaps a speeding motorcycle and a car who made an unsafe turn. 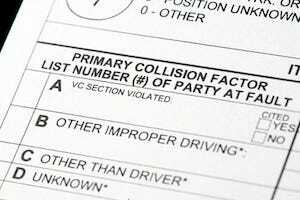 In these situations, the percent that each driver was at fault will be determined. At this point the legal standard of comparative damages comes into play, and individuals who are partly responsible for an accident receive damages at a reduced rate based on the percentage that they are at fault. For example, if the motorcyclist was 30% responsible for an accident, he or she will only be able to collect 70% of the damages. Of course, if a motorcyclist is responsible for over 50% of the accident, he or she will not be eligible for damages and may be sued. 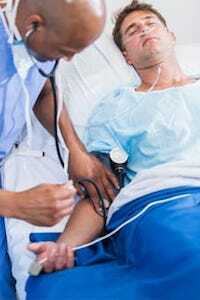 Medical bills: you are entitled to compensation for all past and future medical expenses. Lost wages: You can be reimbursed for all past and future lost income resulting from the accident (including loss of income in a wrongful death case). Property damage to your motorcycle: You can recover for all repair bills or the fair market value of your motorcycle if it is totaled. Pain and suffering: You may be entitled to compensation for any physical and emotional that you experience due to your motorcycle accident. Disability: You can be compensated for any permanent disability that prevents you from enjoying activities which you used to enjoy. Disfigurement: You are entitled to compensation for disfiguring injuries such as amputations, or scars that are the result of your accident. Wrongful death damages: such as loss of companionship or support. These are only awarded by juries in cases with an especially egregious offender. All too often, drivers fail to look out for motorcycles on the highway and city streets. This is especially true in Illinois. If a driver has cut you off or turned straight into your bike, we can help you recover the money you are entitled to. Not only can we help get the compensation you need to fix your motorcycle, but we can also help you recover any lost wages and money needed to pay for medical bills. We also assist our clients who have lost loved ones due to a fatal motorcycle accident. Recovering emotionally should be your top priority; allow us to shoulder the legal burden so you can begin to move forward with your life. If you are in an accident, it is important to obtain legal representation quickly so your attorney can gather crucial evidence. Contact The Collins Law Firm today at (630) 527-1595, extension 221 for Shawn Collins or extension 226 for Edward Manzke, to schedule a free consultation with an experienced member of our legal team. For More Information, Read Our Motorcycle Accident Blog.